Here's Provocraft's new electronic portable device, The Gypsy! •Battery Life – 4 hrs cont. 18 hrs int. This is very close to what I got to preview in the focus group I took part in and it looks great! If they kept it similar to what we saw, all your cartridge info can be stored on this device. 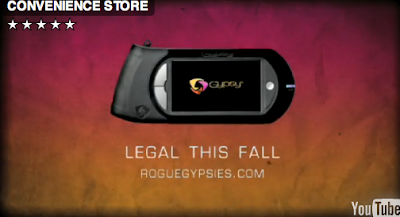 Go out to Rogue Gypsies to watch videos of the new Gypsy! They are quirky and funky and follow a premise of a "bounty hunter" looking for the lost Gypsy machines that were sent out for testing. "The web address you entered is not available. You were trying to go to www.roguegypsies.com"
Maybe inundated by too many simultaneous attempts to access...? Go to You Tube and search Roguegypsies and there are 3 different video's. Cute! Love your blog...lots of info here. Thanks for the information!! You're the bomb! I like your new blog layout and flamingo...I was close--a pig is pink too! LOL. Does anyone know if you have to own a copy of DS for it to work? At this point, I'm afraid to speculate anymore...so wait and see! They should have another video soon! whats the point .. sort of a waste of money isnt it ..